Visiting Santa at the Rainforest Café was such a lovely, magical experience. 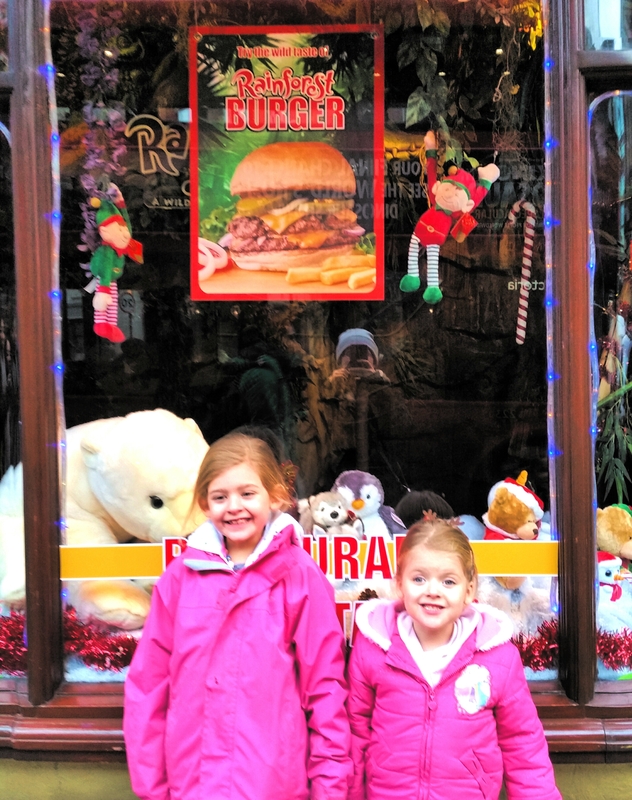 Rainforest café invited us to visit Santa’s Grotto with a meal for the girls afterwards in exchange for an honest review. The rainforest café is close to the Piccadilly circus Tube station which made planning the journey fairly straight forward. We were really excited as my brother was joining us keeping to our Christmas tradition we started a few years ago too. We couldn’t wait to finally visit Rainforest Café after having our original booking moved. Visiting Santa had the girls so excited and we couldn’t wait to get there. I will admit I had a stressful start though, I lost my bank card a week or so ago. Because of this there was an issue transferring money to the Mr’s account. Luckily my brother saved the day and we managed to get on our way but it made me extremely anxious. Going out with very little money is hell! Several lifts were broken at the underground stations which made my travel anxiety worse but somehow we managed the journey with the help of some lovely kind strangers. 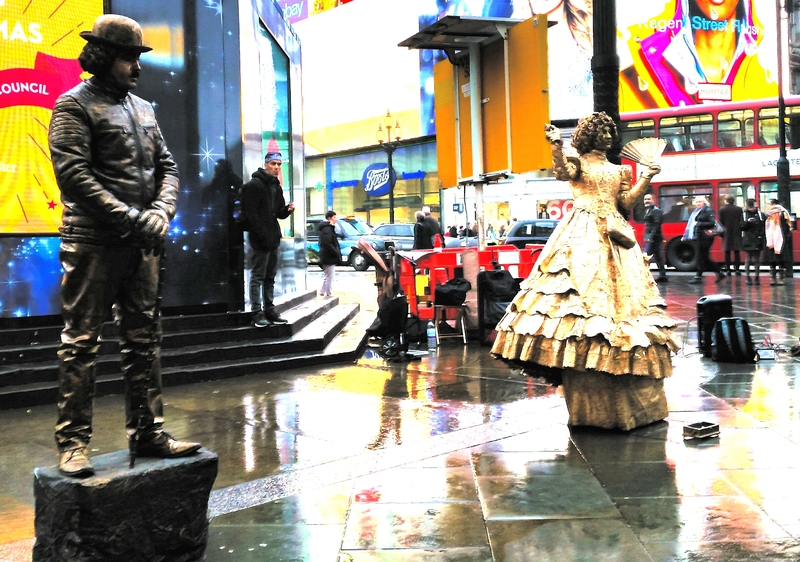 The girls enjoyed watching performers and passing the Piccadilly Emporium on the way to the Rainforest café. With my chronic pain and my brothers lupus and bad legs we were a little bit of a mess by the time we arrived but the staff were so welcoming which really helped put us at ease. If you have mobility issues the amount of steps at rainforest café will be a challenge. I do suggest talking to the staff before booking as they do have an accessible entrance. I had thought we would be ok but my brother and I struggled slightly. After all the stairs at tube stations it was quite exhausting. Totally my fault and totally worth it even if Tramadol will be keeping me going for the rest of the week haha! We went downstairs to the Mushroom bar which was full of fantastic rainforest effects and animatronics which were absolutely fantastic. We were greeted by the elves at the booking desk who greeted the girls by name once they had our time slot. The girls absolutely loved this, the elves were brilliant and stayed in character the whole time which really added to the experience. We were asked to wait at the bar which has some awesome animal stools to sit on. An elf came and took us down another set of stairs after a short wait and asked the girls to find the Christmas trees. When they found the trees she told the girls they had just put the reindeer to bed so they had to be very quiet and tip toe into the grotto. They knocked on the Grotto door and entered a beautifully decorated grotto. Some grottos feel very claustrophobic but Rainforest Café have a large but cosy grotto which was great. Visiting Santa at the Rainforest Café is a fantastic experience. Santa chatted away with the girls using the information from our booking sheet I filled out via email. Eva was delighted when Santa mentioned her teacher. He also mentioned a present she wanted and several other personal details. Izzy spent most of the time chatting away and showing Santa she can do the splits and yoga. She asked him lots of questions and really enjoyed herself. Izzy really loved the Christmas tree and decorations. Santa barely got a word in edgeways with my two chatterboxes, he was fantastic with them though. As you can see they really enjoyed themselves visiting Santa in his cosy grotto. 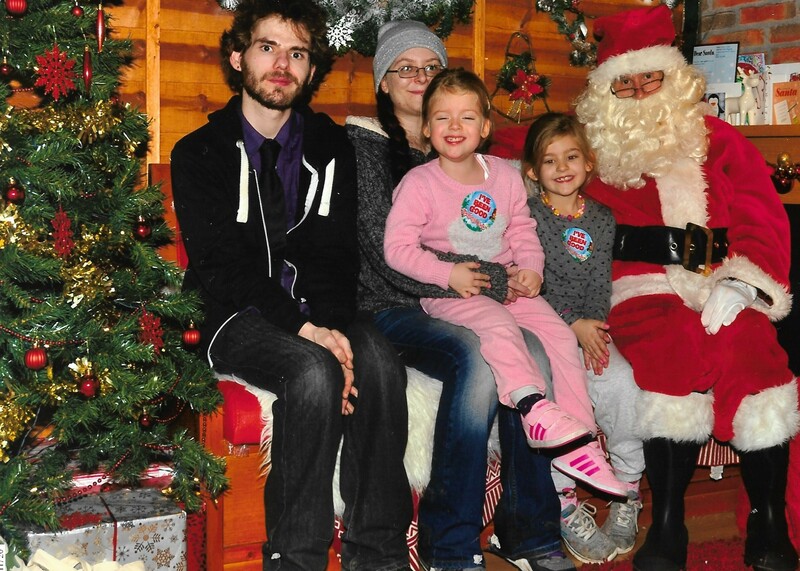 We took a few photo’s of our own and bought a photo of the 4 of us with Santa. This is part of to our Christmas tradition so I was pleased when we were offered a picture of us all. The girls then received a rainforest café tote bag with a gorgeous soft fluffy penguin each. 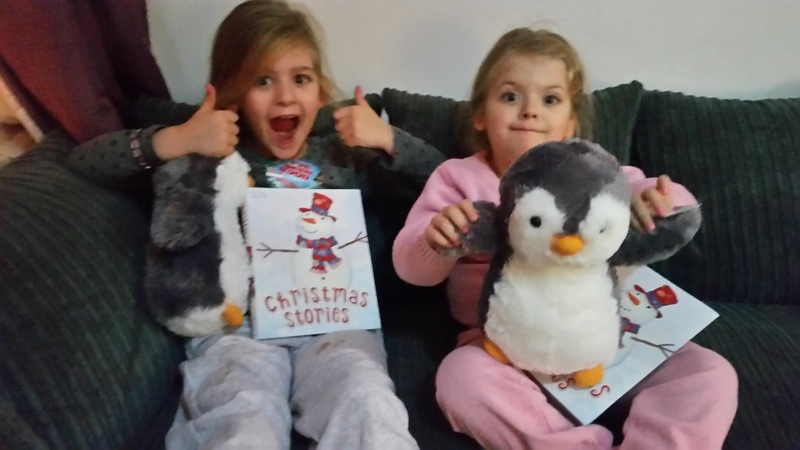 They also received a gorgeous Christmas stories book, certificate and sticker. They absolutely loved their presents and were so happy to be visiting Santa at rainforest café. After our grotto visit we were taken to buy our photo which was £10. We were then told to head upstairs to the restaurant where we were shown to a table. The girls received a 2 course meal and drink as part of the Grotto package. Due to my earlier transfer issue I was unable to order anything myself but the girls meals looked lovely. Eva chose Burger and chips and Izzy had fish cakes and chips. Eva chatted a little too much (every meal!) so her burger went cold but she enjoyed the half she did eat. Izzy demolished her veg and much to my surprise she ate a few chips, they must have been amazing as she is extremely fussy with chips! They both had a lovely dessert after their meal. Eva had the chocolate ice cream with toffee sauce and Izzy had a lovely bowl of fresh fruit. They both left happy with full tummy’s ready to head home. The waitress was fantastic and we didn’t have to wait too long between dishes which was great. The decorations and effects kept the girls amused whilst we waited. Izzy wanted to bring them home.. not sure an elephant that size would fit in the lift though! As we were leaving we of course had yet another problem on our part. Eva spilt her juice over her gifts and herself and began panicking. After our awful start I was close to tears myself. I doubted they could help but I somehow braved asking a member of staff if there was any way they could be replaced. Obviously I would have fully understood if they said no. 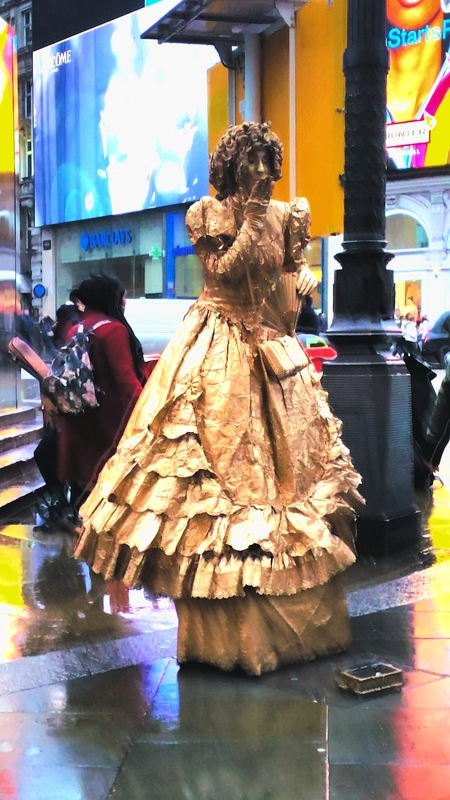 I just couldn’t cope with the thought of a journey home with Eva distraught at rush hour. After such a magical experience I would have felt awful leaving without at least asking. Amazingly the staff managed to find one last penguin and Christmas stories book much to everyone’s relief. I am eternally grateful to the staff who replaced the items for Eva. I took care of them until we got home to prevent anymore accidents. We managed to dry out the certificate with very little damage once we got home to Eva’s delight. Both girls ended their day with smiles on their faces cuddling their penguins. They excitedly told the Mr all about the café, animals, elves and Santa when they got home. 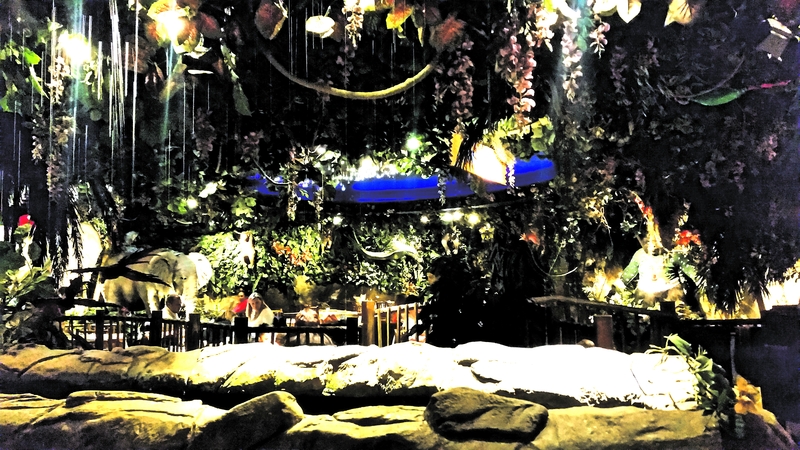 After all our stress it as fantastic to make it to the Rainforest Café to experience their fantastic grotto package. The food and drink are typical London prices. We will definitely go back again with the Mr as the girls really enjoyed the whole experience. I can’t fault Rainforest Café at all, the experience was fantastic. Staff were outstanding and even in our stressed states Alex and I enjoyed ourselves too. We tucked the girls into bed with their penguins in their arms and huge smiles on their faces. They told us they had the best day ever as we left the room which literally says it all! Visiting Santa at Rainforest Café is a magical experience I would definitely recommend trying once. Have you visited the Rainforest café before or booked the grotto experience? Would you book this experience?